Career training and education to become a Fingerprint Technician. We offer an online course of Fingerprint Identification and Classification for students who wish to study at home. Become a fingerprint expert with a law enforcement agency. Would you like to be able to identify unknown victims, missing persons and people engaging in criminal activity? Do you want a serious profession that rewards initiative and skill while serving your community? Are you interested in the detailed intricacies of fingerprints? If so, our Fingerprint Identification and Classification course is the convenient home study fingerprint course that is right for you. Gain the skills you need to advance or begin your career as a Fingerprint Technician, offered through FingerprintTechnician.org. Our highly specialized, distance learning curriculum is designed around you and your demanding work and personal schedule. Our course is delivered entirely online so no need to drive to a classroom. Our forensic fingerprint training can make all the difference when applying for Fingerprint Technician employment opportunities with national, state and local law enforcement agencies and police departments. You will learn the knowledge and techniques used by real world law enforcement fingerprint professionals. 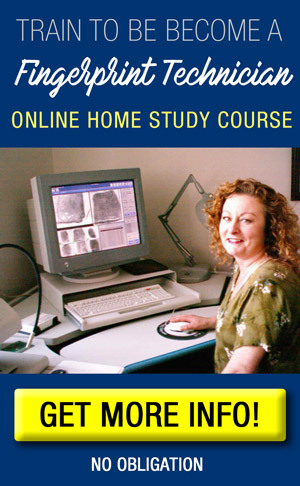 Practical home study training makes learning fingerprint classification and comparison possible and is available for you whenever you have time to study. You will receive the same training as students attending a school or college course on fingerprints. View our online FAQ for more information. Fingerprint graduates can consider entry-level employment opportunities as a Fingerprint Technician. Job salaries for these positions start at an average of $35,000 per year depending on state and city location. With experience, salaries average approximately $45,000-$65,000 per year depending on state and city location. Experience is not required for fingerprint entry level positions as long as the job candidate has the appropriate education for the position. When you study with us you will learn how to identify fingerprint patterns such as arches, loops, and whorls. Our comprehensive program also teaches you the principles of classifying, searching, and comparing specific types of fingerprints. This self-paced course is designed for law enforcement and correctional professionals who desire to learn how to identify and classify fingerprints. The course will consist of lecture, demonstrations and hands-on practical exercises. All material will be delivered digitally. This course contains material equivalent to the 40 hour Basic FBI Fingerprint Classification Course. All reading material and worksheets will be provided to the student in PDF format. Students may wish to print these materials for ease of use. Students are required to demonstrate proficiency through a fingerprint examination to receive a Certification of Completion. You will then be able to take qualification exams for entry level positions in the field of fingerprint identification and classification. The curriculum is a proven way to earn a career in fingerprint classification and comparison. Learn and earn your Fingerprint Identification and Classification Certificate of Completion at home, design your study time around your own schedule. Although automated fingerprint identification is changing the methods of criminal record keeping, the Henry Classification System remains the backbone of law enforcement record identification. This training is vital for any individual who wishes to pursue a career in police criminal identification. We are offering this course at a low introductory price for a limited time only. The FBI offers the same course for $600 and up and requires in-person attendance. Hurry, we will soon be raising the price so sign up today! Can Payments be broke down in installments payments of three by any chance. Thanks for your interest in our course. Unfortunately we do not allow installment payments. Tuition is due in full prior to beginning the course. If you have any questions about the course we would be happy to answer them through our email support system. Our email address is located at the bottom of our course page at http://fingerprint.thinkific.com/courses/fingerprint-id or use the Contact Us form here: http://www.fingerprinttechnician.org/p/contact-us.html . We do not have a telephone support system at this time. Welcome to Fingerprint Technician Training! © 2017. Fingerprint Technician Training. Simple theme. Powered by Blogger.